It is the early 1970's. Famed Austrian author Gitta Sereny is speaking with the few survivors of the death camp Treblinka, one of the most horrible places known to mankind. They are talking about a Jew named Blau, long since deceased as he was murdered in Sobibor. (actually he was tipped off that the Ukrainians were going to shoot him and he swallowed poison). They all knew that Blau was a collaborator, he sold his soul for the hope of survival. 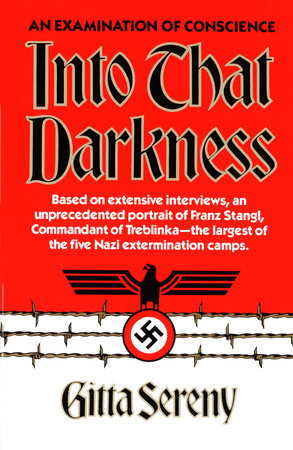 Before the war he knew Franz Stangl, the notorious Nazi who would become commandant of both Sobibor and Treblinka, yet after the war would maintain that he never held any negative views about Jews. Blau cooperated, became a Kapo, and beat other Jews. Gita Sereny notices that the survivors do not seem terribly upset, or surprised. She says, they have "come to terms with the inevitability of human failings in everyone, themselves included. "(Into that Darkness, page 208). Yes, they knew he was an informer, he was an Oberkapo. The inevitability of human failings, what a thought provoking truth. The survivors did not judge him as they understood that we humans are a weak breed, it is inevitable that we will fail at many things. And yet many of us cannot accept this truth, we spend our entire lives and all our fortune trying to fight this. As my dear father used to say we spend our entire lives fighting to stay alive and in the end we will lose, it is inevitable. My dear father understood this truth. Most fight this. They create movies where humans are portrayed as little gods. The Nazi leaders actually believed they were creating a race of "super humans", or "little gods", in fact they were creating the opposite. Children, and some adults, watch cartoons featuring super heroes, a fantasy of what we wish humans were really like. But we are not. We are not this at all. We are very imperfect. The great rabbi, Elimelech of Leżajsk, Poland would say..."Do not look at the faults of our friends, all the more so, Adraba, look at their positive traits". What he was teaching us was that we must accept that all of us have faults but if you want to get along with people you have to overlook a great deal of faults. He urges us to bond together in holy friendships. We apply this very same concept to our Krav Maga. Many styles of Krav Maga are designed for Perfect Humans. In order for the techniques to work they must be performed flawlessly. The practitioners must be super athletes. But this is not reality and in fact these techniques fail in real life violent encounters. They fail because those who teach them fail to understand the "inevitability of human failings". We are different. We design our techniques with an understanding of how imperfect we are. We aim for the Lowest Common Denominator. If we happen to exceed that, Great. We lower our expectations to match the truth of our inevitable failings. The Holocaust can be viewed as a unique experiment in human psychology. Never before were so many people involved in such traumatic situations. Some rose to the height of angels, some sunk to the lowest depravity of human beings. All was revealed; the glory of mankind and the shame. There are many lessons to be learned; today's lesson is that one line, the inevitability of human failings: recognize this truth and you will have better relationships and a better form of self defense. Reject this truth and you are living in a fantasy world. My world may not always be pleasant, but it is always truthful. We go into that Darkness to seek the truth.